Now made with Cliff Keen's Ultra-Mesh Performance Wear material. 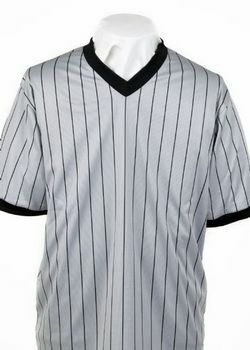 Made especially with officials in mind, this shirt is knit from the finest blend of natural and performance yarns. Lightweight EZ-Care Gray Pinstripe ULTRA-Mesh fabric keeps you cool and maintains its shape, even during the most grueling games. Shrink, wrinkle, and stain resistant for a durable, long life. Feels like soft cotton against the skin. Fortified with our woven fabric technology; it wicks moisture from the body, increasing comfort and providing an intangible performance advantage.